Guilty of a crime of ‘thuggery’ – then objects to being called a ‘thug’! Down memory lane with this the second newspaper clipping! All I can suggest to Jahangir Akhtar, if he doesn’t like being called a ‘thug’, it would have been better if he hadn’t showed this side of his character to everyone! “banned from two scrutiny panels” Ha Ha Ha. After false allegations by Cllr Beck, Anston Parish Council , that I “threatened members of the public” (whom he has failed to name) I was banned from all committees of the Parish Council for a year. So the standards Committee let of Mr Akhtar very lightly in comparison. But there again I am an Independent Cllr who “stepped out of line”, The Labour line, and was “punished for it”. He also made the claim that I called him a Liar, (aw de dums) Yes I did, and its going to be made public, just as soon as my Solicitor gives me the nod. Funny, that when my Legal Team begin enquiring about Cllr Becks (and others) activities at Anston Parish Council, they seem to want to protect him. The protection seems to be also extending upwards to RMBC as well, Mrs Collins the Monitoring Officer seems to think he can do no wrong. (Just enquire how many complaints he has had against him, he who sits on the Standards Committee) Over the next few months things maybe come interesting at Anston. To paraphrase an old Army saying “Watch and shoot, Watch and shoot, Targets WILL fall when hit”. 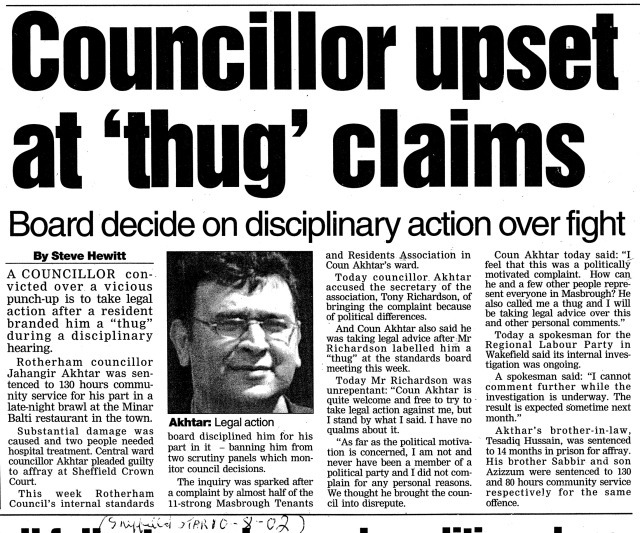 Akhtar, another fine example of the racist Labour filth in this Borough!